2015 saw the last graduating class from S.S. 12, Waubaushene Elementary School. In light of declining enrollment and ageing infrastructure, the Simcoe County District School Board had decided in 2013 to close the schools in Waubaushene and Port McNicoll. To view posts that have been written about other school closures in Tay, click “Tay schools” in the “Tags” portion of the right hand sidebar. There has been a school in Waubaushene for over 140 years, a notable history of learning. This year there were 18 graduates, a class larger than most years recently and the majority of these graduated with honours. The “Last Howl”, held by the school on June 11, was well attended by all students, parents and community members including those who taught previously at the school or whose children used to attend. A bittersweet celebration. 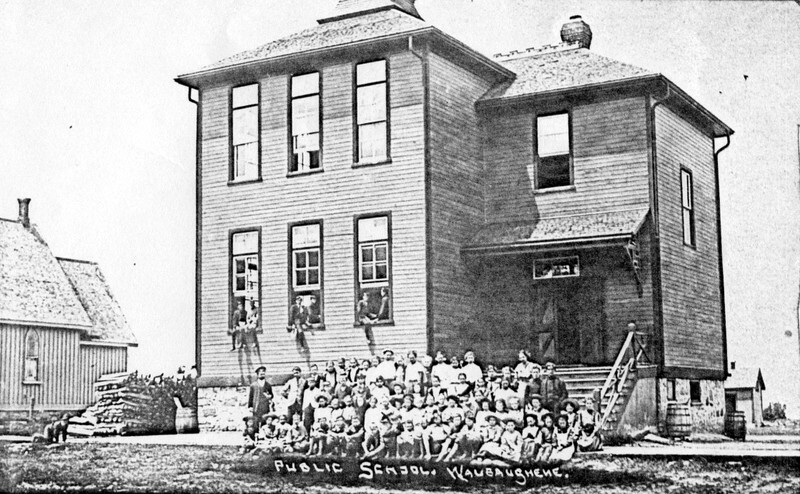 The history of Waubaushene schools dates from 1872. In that year the Georgian Bay Lumber Company provided a small lot and built a wooden 2 room school to educate the children of its employees. The Company was in the process of bringing in workers to staff its head office and huge Waubaushene mill to begin some fifty years of economic prosperity for the town. The school was located on the north side Hazel Street bordering what is now the Tay Shore Trail. Miss Irene Perkins was the first teacher with a salary of $275 per year. The grading system was Junior 1st, Junior 2nd, Junior 3rd, and Junior 4th, Senior 1st, Senior 2nd, Senior 3rd and Senior 4th. 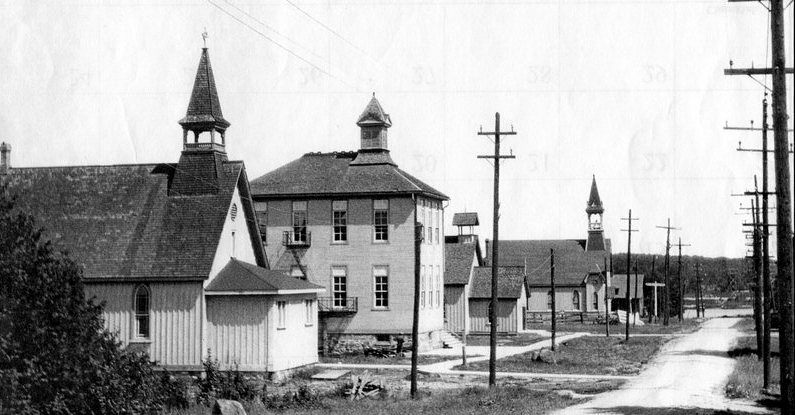 In 1889 a second (Senior) two-storey school was built adjacent to the original school for a cost of $2,140. In 1906 a new Catholic Church was built on Pine Street. The former church building at 46 Hazel Street became available as a school room for the younger children (called the “baby room”) as the lower school was becoming overcrowded. It was officially sold to the School Board in 1915, then to the Independent Order of Oddfellows in 1925. Both Senior and Lower schools had 2 classrooms. Well into the 20th century, neither had plumbing, electricity or a gymnasium. There were water tanks in each classroom but toilets were at the back of the school property. The Lower school was heated using box stoves, whereas the Senior school had a basement with a wood-burning furnace. Emphasis was placed on the 3 R’s, including sentence structure, grammar, spelling, penmanship and arithmetic, as well as history, geography and home economics for girls. Memorization of songs, poems, geographic data, multiplication tables, etc. was routine. Ms. Eva Gervais is remembered by many (including the writer) as their first teacher. Her career lasted for 31 years. During recess games such as baseball, football, jump rope and marbles were popular. Children who lived across the Bay came to school by boat in the summer and walked across the ice in the winter. In spring and fall they would have two week holidays because they couldn’t cross over! (The Waubaushene bridge was not opened until 1927). For the youngsters who attended the Union Church’s Sunday school, the big day of the year came in June when the Sunday school picnic was held on Potato Island and boats were provided for the passage. In 1936 the senior school burned down. A new red brick school was built for $11,242 and opened in 1937. Modern equipment was installed, with rooms for manual training and home economics. Covered later in stucco, the building remains. In 1956 St. John’s Separate School was built beside the Catholic Church, and Catholic students transferred there. This school was extended in 1970, but closed in recent years. In 1964 the lower (original) school was torn down and a brick addition of two classrooms was added to the senior school. Beginning in the fall of 2015, students from the Waubaushene and Victoria Harbour Schools will be bused to the Port McNicoll School. In the spring of 2016, all students will attend the newly renovated Victoria Harbour Elementary School. Hopefully we will see the Waubaushene and Port McNicoll school buildings or properties reused with a new life in the future. This entry was posted in heritage, history, Port McNicoll, Waubaushene and tagged Catholic Church, Georgian Bay, Great Lakes, Huronia, local history, Matchedash Bay, Ontario, Port McNicoll, Simcoe County, Tay schools, Tay Township, Victoria Harbour, Waubaushene. Bookmark the permalink. Huronia Museum has an excellent photo of SS12 Tay from 1963 if you are interested in including it on this site. It can be transferred by e-mail. Regards, Tom Barber, Huronia Museum Volunteer.